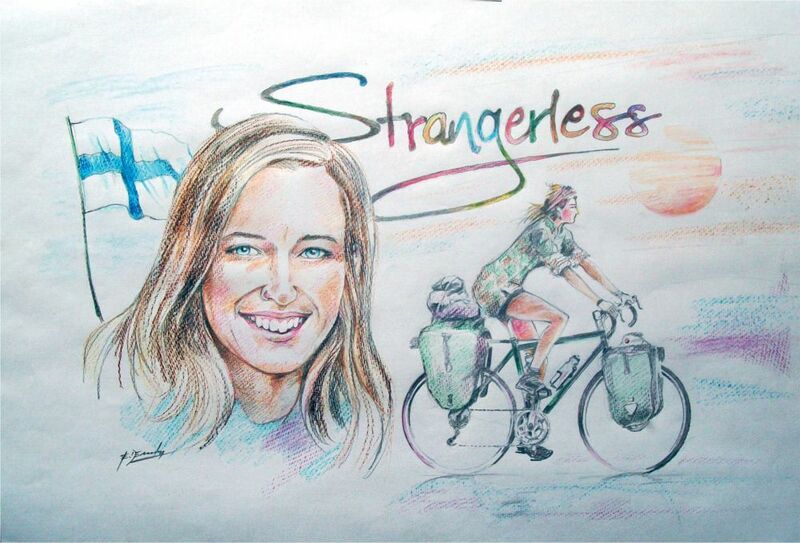 Bicycle touring stories about the kindness of strangers is one of the favorite topics to talk about when meeting other long term cyclists on the road. Some strangers really go out of their way to help a cyclist and I personally often can’t believe how generous, supportive and kind strangers are to me. People helped me tremendously so many times and in 100 different ways and I am more than thankful for everyone who supported me in whatever way. Poor and rich people alike – no matter which religion – no matter which skin color – no matter which country! Being solo on the road can make you lonely and desperate for some social life and interaction with strangers. Of course, I can only speak for myself – but there is one thing for certain – without the help of those loving strangers I wouldn’t have been able to make it as far as I have. Sometimes people paid hotel rooms for me or gave me money – which was great of course – but there are moments where the little things might be even more important. When you are mentally devastated and physically exhausted a little smile, a hot bread and a warm hug might be all you need to get your motivation and strength back to keep going. The love those strangers share with you is the biggest treasure of a journey – at least it is for me – and most of the time it makes for the best stories and the never fading memories. As mentioned before I know that I am not the only one who received loving moments! 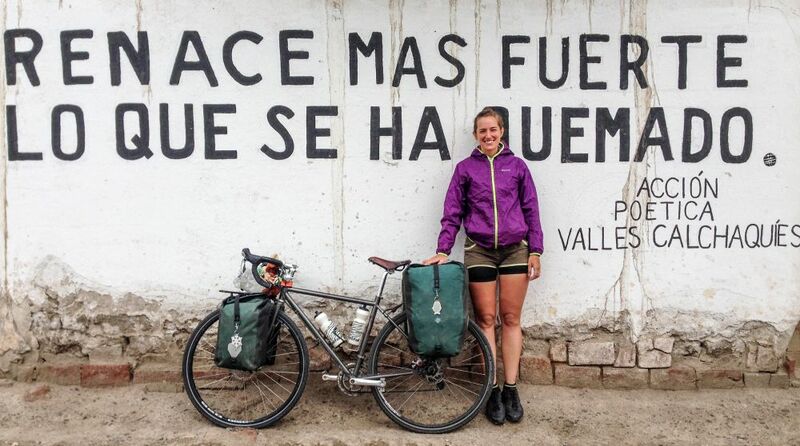 To give you an idea how many nice and kind people there are in this world, I asked 4 other touring cyclists about their possibly favorite and most memorable experience they had with the kindness of strangers. Of course, I will add a story myself. On my map I’d seen what looked like a small track running alongside the Kali Gandaki River. 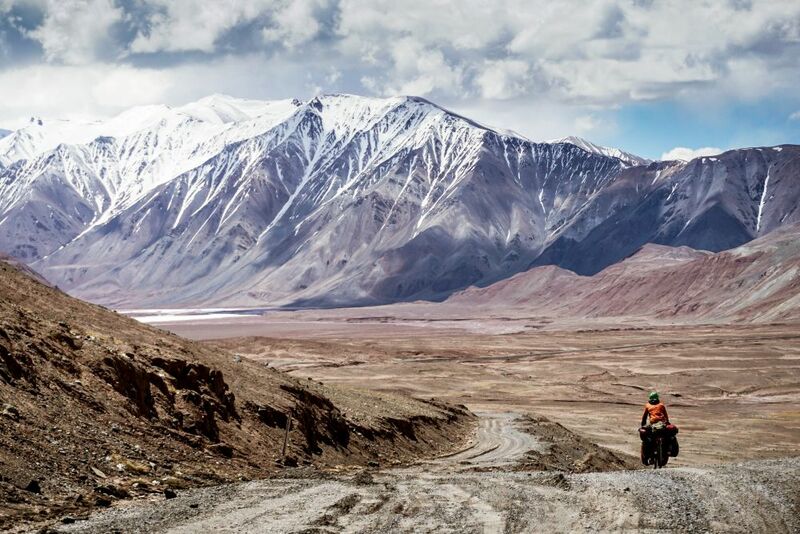 In Tibet, where I’d just spent the previous few months, small tracks were often rideable, so I assumed the same would be true in Nepal. I should have judged from the laughs I received from the locals as I set off for the day that this wasn’t going to be the case. After what turned out to be a day of pushing and mostly carrying my bicycle up and down gorges on a single narrow path with my panniers strapped to the back of a donkey, I arrived in a small village. 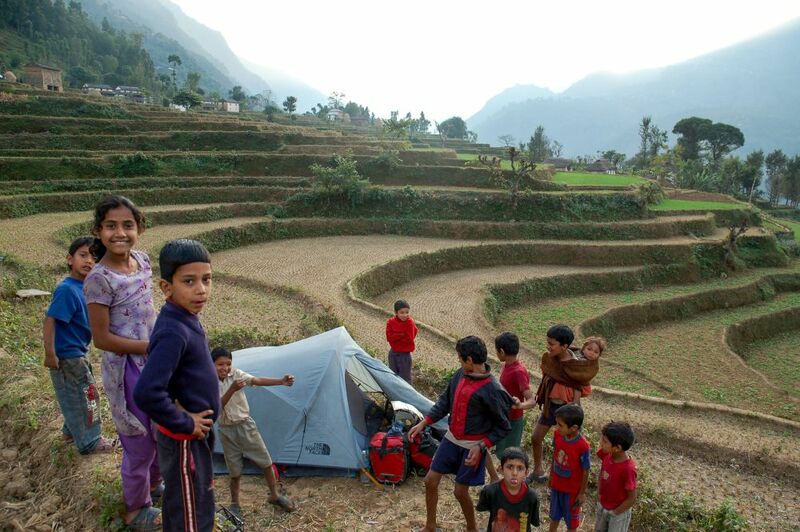 I set up camp on a rice terrace with a view of the Himalayas in the distance. When the rain started falling that night and continued the next morning I knew the track in either direction would be slippy and dangerous. 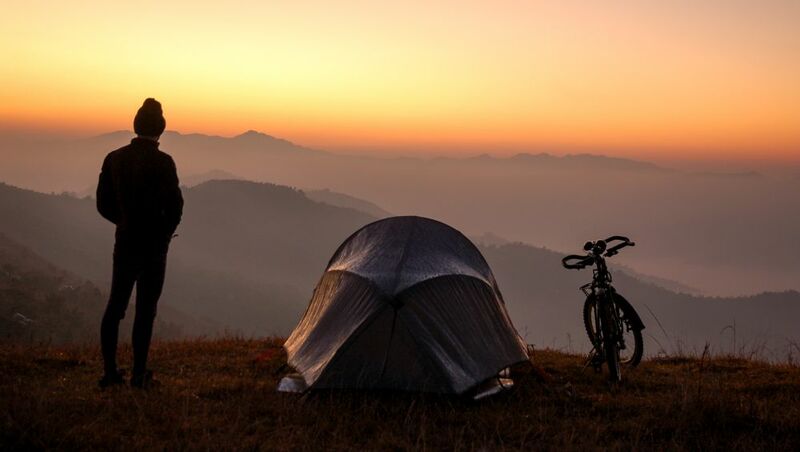 And then I met Bishnu, who’d wandered over to my tent, and like everyone else in the village was probably questioning what a foreigner was doing camped on a rice terrace with a bicycle a long way from any road. ‘You must stay with me. Wait for better weather’, Bishnu declared with a beaming smile after we had said hello to each other. Before I had given it much thought I’d packed up my sodden belongings and wheeled the bicycle over to his small mud-brick house. ‘You can sleep here’, Bishnu later said showing me to a bed. The floor would have been fine, as I’m pretty sure I was depriving someone of a sleeping space, but my suggestion to roll out the mat was out of the question. Bishnu’s kindness and hospitality were overwhelming. I soon learnt a village wedding was taking place two days later. Declining the invitation seemed rude, as did the constant servings of dal and rice that his wife kept serving me morning, noon and night for the next few days. Here I was a total stranger, yet within a day everyone seemed to know my name like I was a new member of this small community. 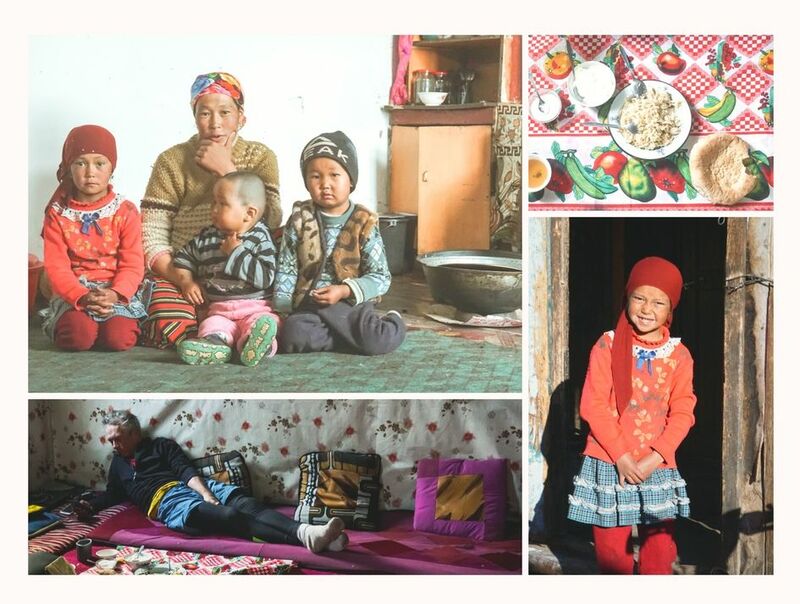 As is often the case with such encounters, leaving proved difficult, but after 3 nights I was saying goodbye – headed back the way I came with lifelong memories of kindness and generosity from a Nepali village in the foothills of the Himalayas’. I glance across the river to see the Hindu Kush mountains staring back at me – figures proud and imposing like petrified Gods. My wheels trace this bumpy line separating Afghanistan and Tajikistan. I wave to Afghani children – small specks frolicking on the other side. Here in Tajikistan’s Wakhan Valley I am surrounded by a stark, elemental beauty of wind and rock. For me, this is a sort of difficult paradise. In such beautiful, desolate surroundings I feel like I am pedalling forward into a state of openness that brings me lasting peace. Solitude normally becomes comfort, but today it morphs into an unwanted apparition. My mind drifts to someone that I met a few months ago. At that moment I longed so much for that connection, to feel comforted in the presence of another human being. Caught in the shadows of the mountains I feel a sharp, painful loneliness. As daylight begins to fade, I reach the outskirts of a small village. I had hoped to find a small homestay where I could buy some bread for the next day and perhaps stay the night. I get off my bike and begin to push my heavy load down a dusty, rocky side road, where a faded sign reading “homestay” points me. I walk back and forth between several houses, unable to find any sign of one. An elderly woman suddenly emerges and begins to approach me. Her movements are graceful and calculated like a dance that has been perfected through the ages. I put my hands together and lean my head against them in attempt to make the universal gesture for “sleep”. “Homestay?” I asked. She shakes her head but smiles and beckons me to follow her. She takes me inside her home and into a room where I leave my bike and bags. It is dark inside, but rich, intricate carpets cover almost every surface and bring life to the gloom. She leads me into the main room close to a wood stove and sits me down on the floor. Her hands are weathered, shaped by the elements. Deep creases run from wrist to fingertip, each a dried riverbed, once mighty like the Panj. She gets up again and brings me a thick shawl-type garment and drapes it over my shoulders. She lightly squeezes them and I feel like a long lost granddaughter. She motions for me to stay seated and later comes out with a pot of tea and a tray of sweets. We only communicate through gesture and soft eye contact. There are no words exchanged, but at that moment I feel a comfort that transcends any language barrier. This woman came into my life just when I needed her most. We connect on a level that I can’t describe. It was as if she sensed what I was experiencing. I felt like a ship that was once on course for the horizon and now I just needed a harbour. We were strangers, but in the silence of that motherly stare I heard every word that I needed to hear. 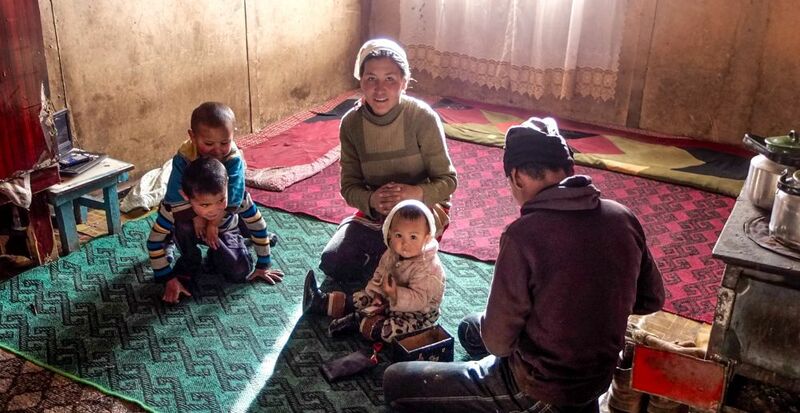 Soon her daughter and husband arrive at the house, looking to entertain the foreigner with lively Tajik music from a DVD and later some impromptu dancing. I stayed in the same spot most of the night, smiling, with my grandmother never far from my side. 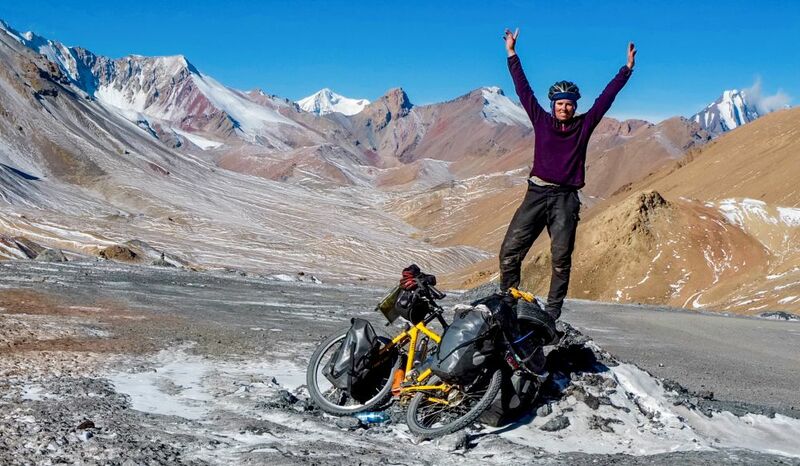 A vicious wind whipped and snow swirled as I struggled to push my loaded bike along the rough road. The flakes were tumbling so thick and fast that I’d lost sight of my husband. Where was he? That bright red jacket was usually so easy to spot. 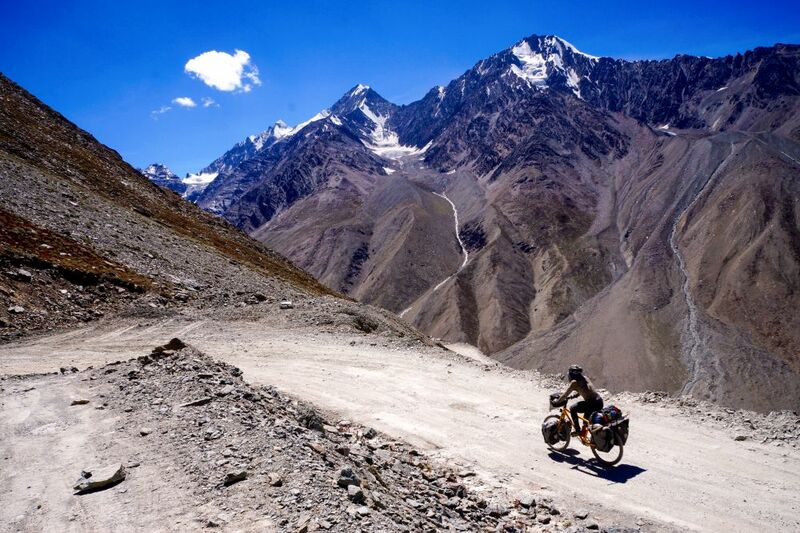 It was the 1st of June and Day 1 of our highly-anticipated Pamir Highway tour. 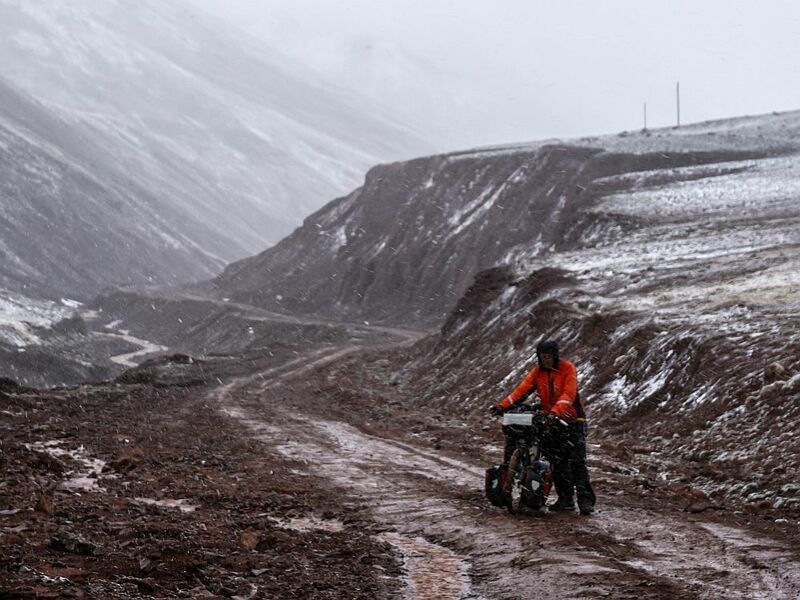 The unexpected blizzard conditions were dampening the delight of biking through some of the world’s most majestic mountains. My husband was missing, and, if that red jacket didn’t pop up on the horizon soon, my mild angst risked becoming full-blown fear. Stay calm. I’m anxious by nature and adventure travel doesn’t always come easy. I’ve had to learn to talk myself down from potential panic. This is just a little summer snowstorm, I reassured my jittery brain. The Kyrgyz border post isn’t that far away. This is not Everest, after all. A few deep yogic breaths and I regained my composure. ‘Eric, Eric, where are you?’ I called out into the emptiness. No answer. ‘Hey, don’t mess around. Where are you?’ I hollered. My efforts were fruitless; no reply broke the eerie silence. 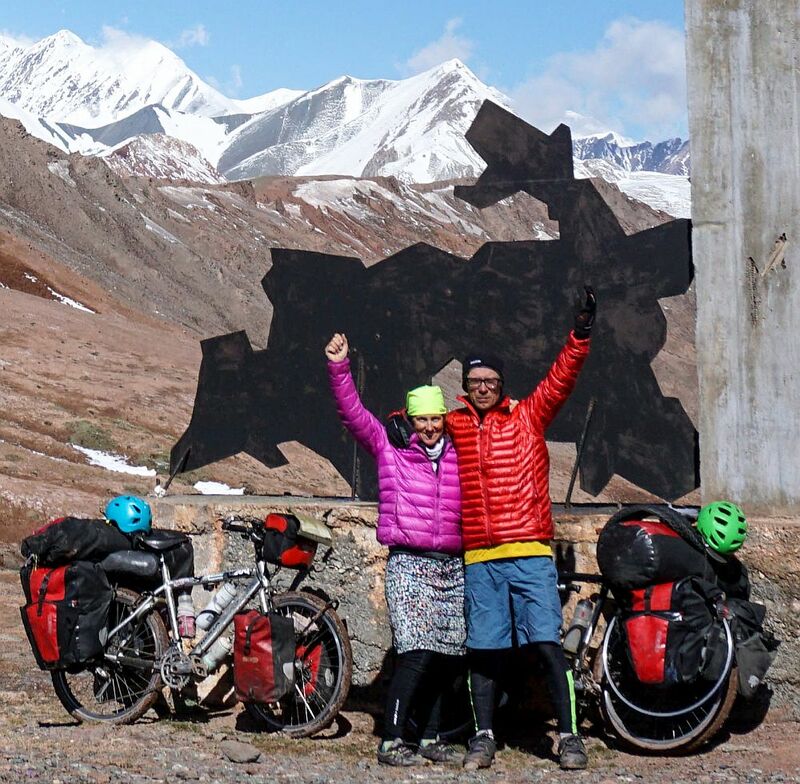 Had I really managed to lose my husband in the Pamir Mountains? Highly unlikely, I conceded. Visibility was almost zero, but I could still make out the deeply rutted track. But then again, we’d got caught in a downpour while cycling through the Sahara, unwittingly camped on a military base in Myanmar and managed to get lost less than 10 kilometers from Eric’s hometown. These misadventures clearly proved we have a flair for bungles and blunders. Maybe he was lost. As I pondered my predicament, the sound of a motor sputtering in the distance caught my attention. So we weren’t alone in the vast no-man’s land separating Kyrgyzstan and Tajikistan. I was beginning to wonder since we hadn’t come across a single vehicle since beginning our slow chug towards Kyzyl-Art Pass. The visibility was so poor that by the time the driver of the battered Lada spotted me, he had to slam on his brakes, barely missing me as the decades-old car skidded to a halt. Seven astonished faces peered out of the tiny vehicle. When my exuberant Dobry Den was met with a round of smiles, I knew help had arrived. ‘Are you alone?’ asked a burly gentleman dressed in military garb. ‘No, well…yes, at the moment eerr… I seem to have lost my husband,’ I sputtered. ‘You lose husband? We find him!’ exclaimed my confident hero in faded fatigues. I objected to a rescue mission, realizing that Eric probably wasn’t lost, just lagging behind. The men, however, could not be deterred and insisted on setting off in search of my MIA riding partner. They had a mission to accomplish. I chuckled, unsurprised by the news that hubby had sought shelter to wait out the storm. He always said it was inefficient and a waste of energy to fight the wind. ‘Husband coming slowly. Very slowly.’ Obviously, this crew was not impressed with my guy’s physical prowess. ‘There is house ahead. Maybe three kilometers. You sleep there tonight.’ And with that much-appreciated piece of advice, my seven-man rescue team sped off. A re-energized Eric soon caught up and we slogged on together through the driving snow. The high altitude coupled with the arctic climate conditions sapped our energy reserves. Camping sounded like about as much fun as skinny-dipping in Siberia in December. After three hard-fought kilometers the house came into sight. We knocked and the door was opened. That night was spent at the home of strangers. Generous people whose language we don’t speak and whose kindness we can never repay. Simple people who didn’t ask questions when two fatigued foreigners turned up on their doorstep. That night I slept peacefully, warm and toasty sprawled out in front of a wood burning stove, content in the knowledge that the world is a good and beautiful place. One fine day in November 2017, I arrived exhausted and strengthless to a little village called Campo Largo. This was in the Argentinian Chaco, the second poorest province of Argentina, and a place I remember vividly from its mammoth sized, flying grasshoppers, its sunburnt men making tiles on the roadsides and the beaming heat of its endless, flat roads. The nights before, I had already been hosted by a group of young adults organizing a book fair and by a pharmacist wanting to protect a lonely, female traveler, by offering to pay for a night at a local hotel. Thus, even up to that point everything had gone more than well. Yet this time, I was in for a real treat – the house of Sister Renée. I had sat at the doorstep of a low, grey house for nearly an hour with a statue of the Virgin Mary as my company, when suddenly the main door of the house was flung wide open. A pair of eyes looked down at me and my bicycle, and the grey-haired lady standing by the door invited me inside. “Welcome!”, a crew of ten cheerful women greeted me in unison, as I had just barely stepped over the threshold, dragging my belongings behind me. Soon thereafter, I was seated at the end of a long, wooden table and the questions started flowing at me. “Where are your kids?”, “Are you married?”, the women asked. And as I answered, some of them were blown away by my story, others were terrified. 34 and still single! What a waste! Yet, what they all agreed upon was that I couldn’t leave the village before visiting the local school, the local kindergarten and the local orphanage – all founded by Sister Renée, who sat between the ladies, humble yet graceful. Although I wouldn’t have needed anything to convince me to stay, the women did everything in their right minds to make sure I wasn’t going anywhere. 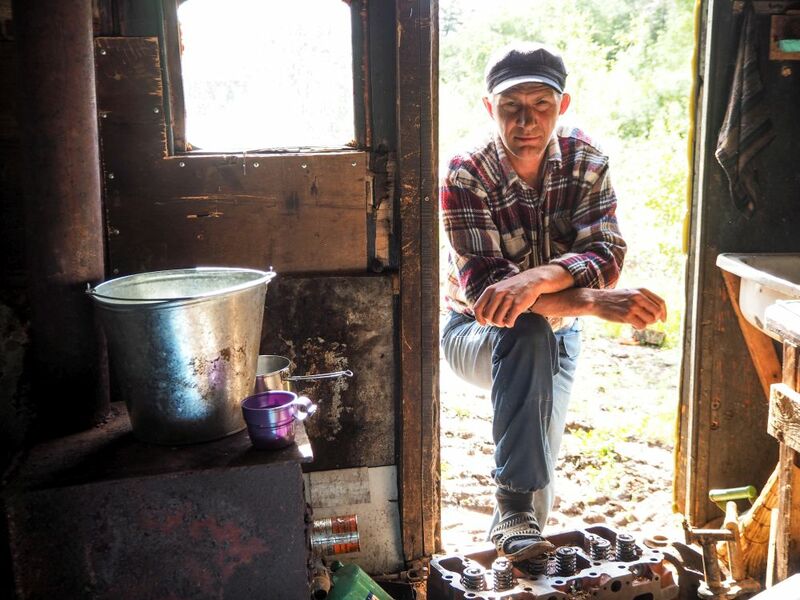 I was offered a shower, a washing machine, delicious meals, a soft bed – and even WIFI. I was taken to beautiful sunflower fields out of town. 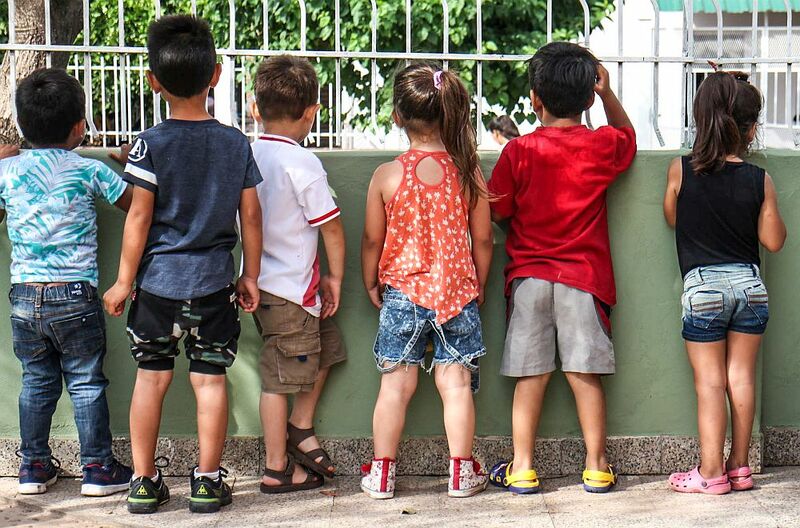 I was accompanied for walks around the village and introduced to the lovely little children of the orphanage. Eventually, I was even given a bucket and a sponge for washing my mud clogged bicycle. 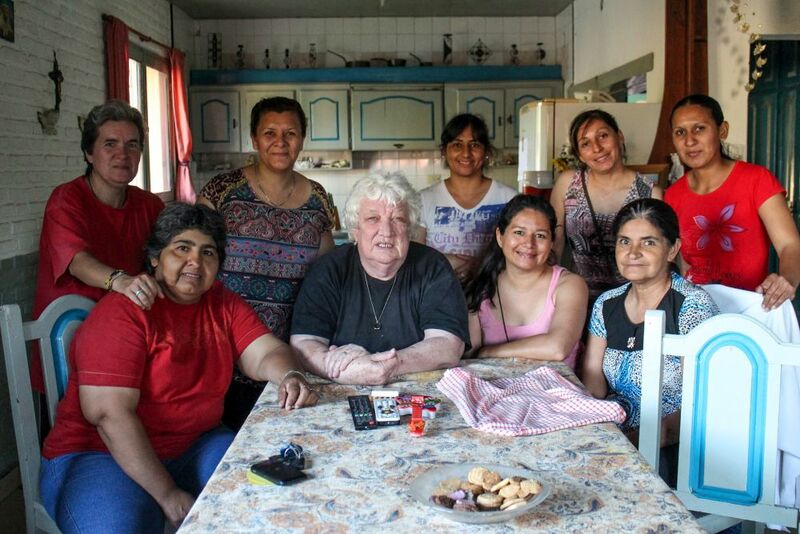 Sister Renée was a Belgian nun who had lived in Campo Largo for 40 years. According to her words, the town had stayed quite the same during all those years, except for the asphalt on the roads, and the school, kindergarten and orphanage she had built. It became clear to me that I had ended up in the house of what one could call the “Guardian of Campo Largo”. Thanks to Sister Renée, there was education in town. And thanks to her, I had a warm, dry, loving place to sleep at. I stayed in the little town in the middle of nowhere for a few days, before the time to pedal off slowly dawned upon me again. Being still is not my virtue, and although I lacked nothing, I felt I had to move on. When my panniers were all set and I was ready to take off, the women of the village gathered around me and my bicycle. Loading me with fruit and empanadas, they all hugged me one by one, and with tears in their eyes, said goodbye. It was almost dark but I still searched for a place for the night. Thick forest surrounded me. Remoteness. 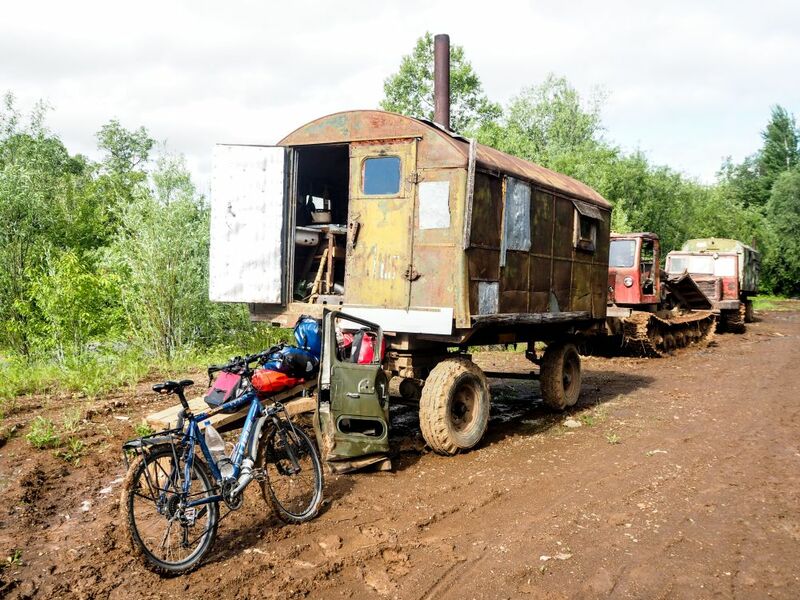 I was in the middle of nowhere, somewhere in Outer Siberia – the last frontier of Russia. I was nervous, very nervous. Actually, that is not entirely true, I should rather say I was scared – super scared. This area is inhabited by brown bears and it was my very first night away from Russian civilization and exposed to the Siberian wilderness. A car, the only car that day approached me. 2 elderly men smiled at me and asked where I am staying tonight. “Palatka” was my answer, which means tent in Russian. They laughed out loud, made gestures about the bears, scaring the hell out of me then treated me with a chocolate bar and drove off. “Heike, you need to pitch your tent, it is almost dark” I tried to encourage myself. But I really wanted a miracle to happen. “Only another kilometer” I said to myself with some last hope for something to happen. “A trailer, there’s a trailer” I almost shouted out loud. “There must be people”. The first trailer was locked. The second was locked, but there was light in the 3rd one. A dog began barking and there was some noise within the trailer. A very tall lumberjack with hands like bear paws opened the door and crouched to step out of the wagon. “Shoot, only one guy?” I wasn’t all that sure if the bloke was more dangerous or the bears. He waved me in and offered a tea and a place to sit in his chaotic little place. Two beds were inside and he said I could sleep there with him. “We can watch videos together and eat and drink”. “Musch”? he asked – which meant where is your husband? Gosh, I guess I am in real trouble here that’s all what crossed my mind. I pointed at the other trailer and asked if I could sleep in the yellow wagon? “No, you can sleep here with me” but I tried again and said, please I would like to sleep over there. He started cooking a hot soup, poured more tea in my cup, smiled and tried to make me feel comfortable. But all I felt was uncertainty. Before I was only scared about the bears, now I was scared about the bears and this guy and I was cross with myself that I had brought myself into this unpredictable situation. After eating the delicious soup, he showed me the other trailer, opened the door and helped carry my bags and bike in, then said good night. The mosquitos were crazy that night, the mice were running around all over and my heart rate was 30 beats higher than usual. 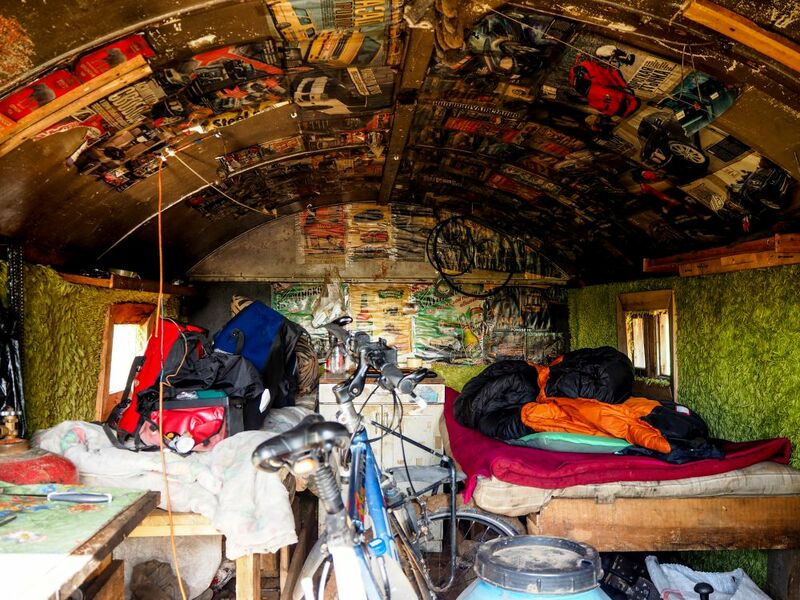 The blanket and sheet were a hundred years old, naked ladies decorated the ceiling and old oil canisters made the interior a bit stinky. I locked the door as best as I could with strings and felt like I was a bit mad that night. A few times I heard a noise and thought “shoot the guy is coming” but at some point, I was just tired and fell asleep. “Chai” is what I heard when I woke up. The lumberjack knocked at the door and asked me to come over for breakfast. We sat and talked, ate and laughed and even hugged when we said goodbye. I was again amazed by the kindness of strangers, absolutely thankful for his hospitality and cross with myself that I hadn’t trusted him at first. We were just two lonely souls seeking for some company. Ho my God, i can’t beleive looking at the family picture Eric and Amaya posted i recognized them from my trip in 2010. I spent few days with the same family. They were so kind to me. It is a memory i cherish very mush. 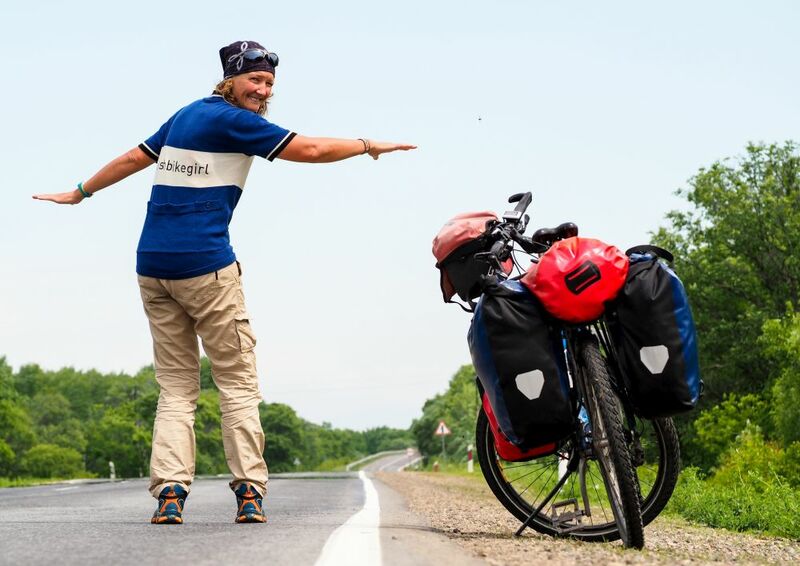 I was cycling solo and after a long windy and cold day they were my angels after passing the Tajikistan/Kyrgyzstan border..
That’s amazing Celine….there are so many wonderful people in this world! Heike, really nice read and photos. Thanks for introducing us to some other world travelers. And thanks for promoting a positive view of the world at large, it’s to easy to hear nothing but the “bad”. Again, good job, nice mix of stories with some tugs at the heart and some easy laughs. Thanks Ron….yes the world is a great place and full of wonderful people! I like your attitude of exploration and adventure combined with civility and kindness. My wife and I have met so many great people through cycling that each day my spirit is renewed. So much truth in “each day my spirit is renewed”. I read these great stories on Valentine’s Day. They reflect the true meaning of love, the outpouring of care and compassion without any thought of reward. If only the rest of the world would take notice and act accordingly we would live in a world that God originally intended it to be. I trust I will treat strangers, as all of the writers were treated, so that I can make a little difference in the world that surrounds me. Thanks for sharing. Thanks Paul for your nice words! And I am sure that every stranger will be happy to receive your kindness! Great stories. Happy Valentine’s day!? I have to stop whatever I’m doing to read your posts, Heike. 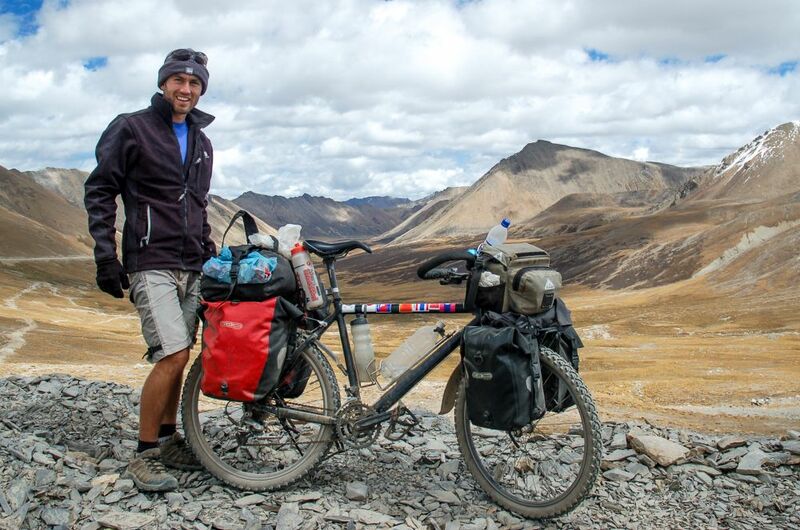 Thanks for sharing your stories, and those of your fellow cyclotravelers. It warms my heart to learn of the kindness and generosity of people who host, some with but a little to share. Thanks very much Drew….have a happy day! Tiefe Gasthoeflichkeit ist ein Geschenk der Goetter! Man findet sie überall. Danke für die Geschichten. So true and many times hard to explain. In many countries people are so hospitable. Nice topic! Hi Heike. Such great stories, but they don’t surprise me. My wife Colleen and I are riding home to Knysna, South Africa from Amsterdam and we have had a few encounters similar to those described along the way. We start riding in the morning knowing only the direction in which we are heading, our final destination a complete mystery, but it all works out in the end. The world is a wonderful place full of very generous people and if only the media could focus on these types of stories we would all be less fearful of each other. Thanks Peter, yes I couldn’t agree more it is such a shame that the media is always telling us how dangerous the world is. Enjoy your ride and enjoy the wonderful people along the way…. I think the world is both dangerous and wonderful. The same with people. Both dangerous and wonderful. The mix/ratio simply changes. And the question confronting us, is who are we? Hospitable or judgmental? Probably both at some point. Vulnerable or untouchable? Both. The glass is either half full or half empty – your attitude towards life can be either positive or negative. There are bad people – sure – but in comparison to how many good people there are it is a shame that we are focusing on the bad. 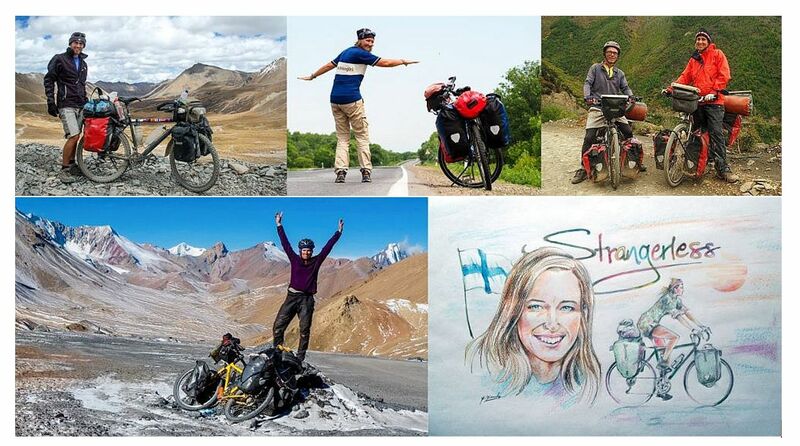 Really enjoyed reading these stories of un-expected encounters and kindness from strangers, so thanks for posting them Heike!